Fee Waybill and the guys regroup and return following a ten year hiatus and departure from Capitol Records with their first album on the Critique label. Despite filling the years between 1986 and 1994 with The Tubes on my Walkman, I didn’t come across this album until much later. Thing is, HMV were never any good at stocking records for non-mainstream bands, even though the Tubes were fairly mainstream at the height of their career. Trips to the HMV in Church Street, Liverpool, during my youth would see me flipping through the Ts..TUs…TUB…Oh bugger..TUBEWAY ARMY…no Tubes. “Never heard of them mate” was the mantra from the shop staff. And yet, it seems, The Tubes were more influential than we know with some members of the band having sessioned with Chris Isaak , and with Richard “Hazard” Marx producing today’s album. To say Genius of America takes off from where Love Bomb ended is incorrect. Stylistically, the album is Tubesesque but it’s a far cry from Remote Control and Completion Backward Principle. Indeed, it’s almost as if the band have had a style transplant during their hiatus, because unlike other bands that have split and reformed, there is a recognisable difference in sound. I’m still waiting for it to grow on me. Unfortunately, I am unable to back up my conjecture with my usual inclusion of a sample Youtube video for this album. It seems that the copyright police have cleared it of any of the tracks from this release. So instead, here is one of the band’s classic songs. 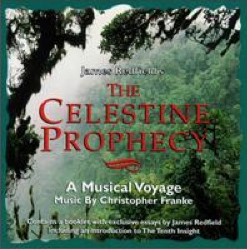 A musical “accompaniment” for the best selling book by James Redfern which sparked off a new age revolution in the 90s. Plenty of floaty tofu weaving vaginary in this album as well as new age world m-yewsick wankery. And pan pipes. Lots of pan pipes. In collection for interest only. Weird Al returns to the project once more. 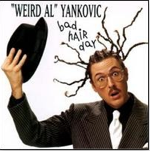 This time with the 1996 album Bad Hair Day. Al does the treatment on U2, Forest Gump and Gangster’s Paradise. The second Ayreon album in this project. This is a really good album. I really wish the UK made more out of our European cousins music. 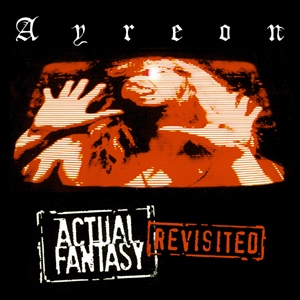 There are some really good bands over there and had I been aware of Ayreon in 1996, I would probably have bought this album then. Think hair. Lots of hair. Think synth. Lots of synth. Think rock guitar. Lots of rock guitar. Add a sprinkling of Jeff Wayne and you have Ayreon. The album is like a compendium of short stories with each song telling a tale about some weirdness involving time travellers, computer zombies or fantasy worlds where books can kill. If you like Jeff Wayne, prog or your songs to tell stories, then this is one artist you cannot afford to ignore in your life. The best song, in my opinion, is Abbey of Synn which has a catchy tune and a chorus that will lay ear worm eggs in your mind.